Let´s welcome June at the luxury hotel in Alicante Asia Gardens Hotel & Thai Spa. 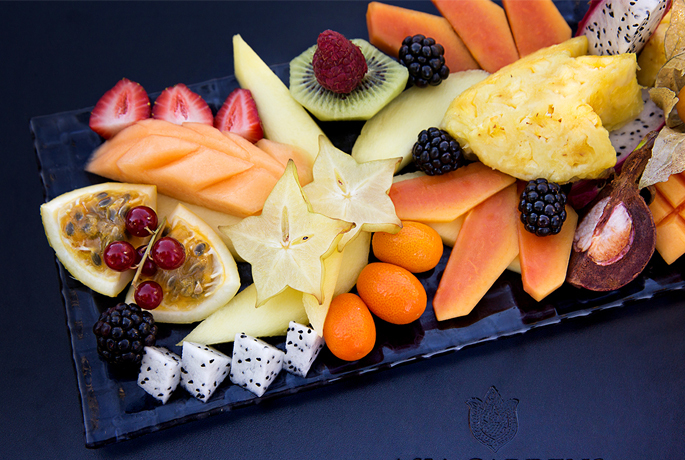 Can you imagine a better option to take care of ourselves and staying hydrated this spring than enjoying the most exotic fruits in China? Find out more about them here! Dragon Fruit. Also known as Pitaya, it is grown in Asia and America. It is a strange-looking fruit. It is a deep pink colour on the outside and the inside of the fruit is fleshy and contains seeds, just like the kiwi does. It has a sweet taste and it is known for its excellent nutritional value. The fruit contains lots of vitamins and minerals, including vitamins B and C, iron, phosphorus, magnesium, and calcium. It also contains high levels of antioxidants and water. It is a very versatile fruit: it can be eaten raw, turned into juice, combined with salads and even added to pizzas. the litchi family, the Sapindaceae family. Longan is smaller than litchi and also has a different taste; sweet and sour. It is used in all type of salads, cocktails and sauces, it gives any recipe a special touch. Mangosteen. Also known as the “Queen of Fruits”, this tropical fruit grows only in warm tropical climates; it is only grown is Southeast Asia. It boasts an extremely high water content. It also contains potassium and provides fibre. It is a fruit with a hard, dark-purple coloured shell and a gel-like covered seed inside. It has a sweetly tart taste that resembles the flavour of a peach or tangerine. Rambutan. This tropical fruit, native to Indonesia, belongs to the same family as litchi. In fact, due to its appearance, it is commonly referred as “hairy litchi”. Rambutan is a small, round tropical fruit. A bright red skin surrounds the fruit, which is full of small green spikes/hairs that make the fruit look hairy. Once you peel the skin, the fruit inside looks like a smooth and moist white ball. Its flavour is fresh and a little bit acid. It contains lots of carbohydrates and vitamin C. Experts call it super fruit, due to all the healthy benefits it offers. The perfect plan to celebrate the upcoming arrival of summer is awaiting for you at the luxury resort Asia Gardens Hotel & Thai Spa. How about renting a Balinese bed with a selection of tropical fruits and the best European champagne by the pool?